To quickly find the answer to a Trivia Crack question, simply start typing the question (or a few keywords in the question) into the search field above. Seeing that this game has over 100k questions in its database, it would be near impossible for one individual to compile answers to ALL of them in a short time. We at itouchapps.net will aim to provide answers to as many of the questions as possible, to be added gradually over the next while. 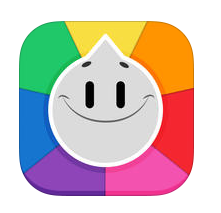 Trivia Crack, an app developed by Etermax, is the most addictive trivia game app ever made. It is conveniently available for both ios devices and android devices. This is not a game you can play by yourself. The app needs to connect to the internet to match you up with your friends or random people who are playing the game at the same time. Each play consists of spinning a spinner to choose from 7 results: 6 available categories – Science, History, Entertainment, Geography, Art, and Sports – and “the crown”. If you get one of the categories with the spinner, you’re posed with a question in that category. If you get the crown, you get to choose a category to answer a question from, and if you get it right you win the cute character for that category. Every correct question will fill your “crown meter” and give you a shot at a cute character. The objective of the game is to collect all 6 cute character icons representing all categories, at which point you win the game against your opponent.